Oakleaf hydrangea, botanical name Hydrangea quercifolia, is a large, flowering shrub native to the United States. Gardeners value the plant for its ease of care, tolerance of shade, bold foliage shaped like oak leaves, and huge clusters of fragrant flowers. The shrub blooms slightly later than smooth-leafed hydrangea and grows up to 8 feet tall in the home landscape. In fall, the plant's leaves turn an attractive, burgundy-red color, which adds interest to the fall and winter garden. Hardy to U.S. Department of Agriculture Plant Hardiness Zone 5, oak-leaf hydrangea thrives in most areas of the country with minimal care. Plant oakleaf hydrangeas in mid-spring in a location that has fertile, well-drained soil and receives bright morning sun and afternoon shade for optimal growth and blooming. Space oakleaf hydrangeas at least 4 to 6 feet apart. Spread a 2- to 3-inch layer of mulch over the soil surrounding the plants to conserve moisture and deter the growth of competitive weeds. 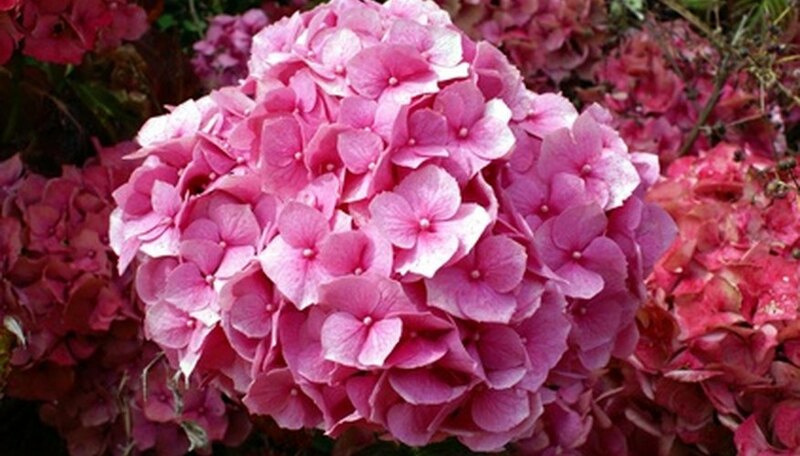 Start the mulch layer at least 2 inches from the base of the hydrangeas to prevent disease. Water once every five days during the first spring, summer and fall of growth. Reduce watering frequency to once each week thereafter. Soak the soil thoroughly at each application to ensure moisture comes into contact with the roots. Feed three times per year, once in March, again in May and finally in July. Use a balanced 8-8-8 NPK (nitrogen-phosphorus-potassium) fertilizer to provide necessary nutrition for flowering and root formation. Fertilize at the rate described by the manufacturer's instructions. Prune oakleaf hydrangea once each year, immediately after flowering has ended. Use pruning shears to remove any spent flowers and dead wood to improve the aesthetic appeal and health of the plant. Remove a third of the oldest branches to improve air circulation. Failure to bloom may be caused by too much shade, excessive nitrogen, frost injury or untimely pruning. Remove spent flowers as often as possible to encourage the formation of new blossoms.